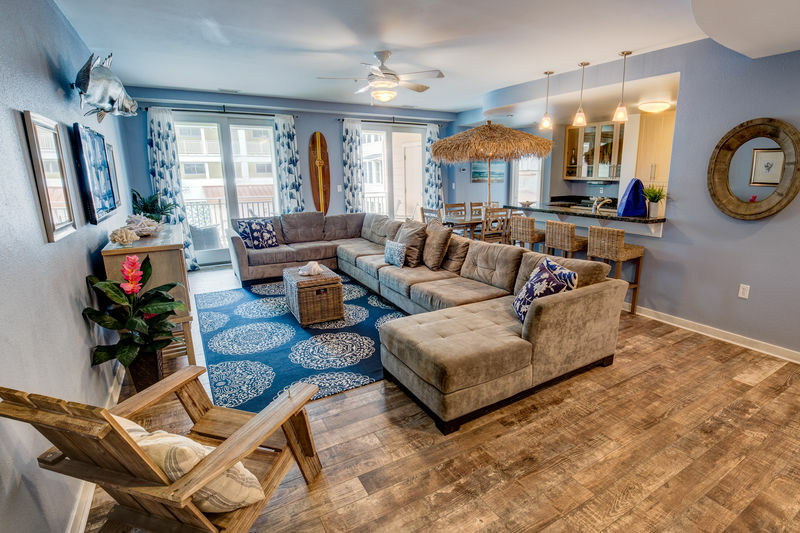 Find yourself "Chillaxin” at the beach in this Sanctuary at False Cape Condominium with a fun and charming décor so you can enjoy that island feeling all through your stay. Sanctuary is known for the upscale appointments and amenities and "Chillaxin” offers an ambiance accent to make it your perfect stay at the beach. This appealing unit is one level on the 2nd floor with elevator access from the condos covered parking garage and other common areas. The condo was designed with spacious rooms, granite countertops and stainless steel appliances. The layout offers a spacious feel so you aren’t crowded and the balcony overlooks one of three community pools. In the Great Room a huge sectional sofa gives room for everyone on movie night…binge on Netflix on the HD LCD TV or watch movies on the Blu-Ray player. Relax to your favorite playlist with the iPod dock. Of course, the most fun (besides the beach) is the Tiki Hut umbrella over the dining table with lighting so you will enjoy all meals under a Caribbean flair design! All bathrooms have granite and custom tile finishes and the bedrooms are themed to add to the fun! There is the "Maui Maui” master, with a king bed, a spacious bathroom LCD TV and Blu-Ray player. Then the "Loggerhead” master is boho-chic with a replica loggerhead turtle and hand carved furnishings. It has a king bed, direct access to the second bathroom and a LCD TV and Blu-Ray player. The kids room is the best! The "Crew’s Quarters” is like sleeping in the hull of a submarine, and has full over full bunk bed. It is decorated with scuba gear, portholes and even a treasure! Need more space? Pull down the Great Room murphy bed for additional sleeping space and it’s out of the way when you need the space. Amenities for the Sanctuary include two fitness centers, oceanfront pool and cabana bar, two large pools, grilling stations with tables, library, and an oceanfront boardwalk. Little Island Park playground and fishing pier is an easy walk down the beach for you and the kids. There are kayak launches and nature trails all through the sanctuary at the south end of Sandbridge Beach. A day trip to the Virginia Beach Aquarium would be enjoyed by all and they have an adventure park with zip lines and more! Or cruise the boardwalk one afternoon for shopping, restaurants and people watching. Stay at "Chillaxin” and you have a quiet beach retreat, long lazy days by the ocean, and plenty of action just a short drive away. One Level: Great room with LCD TV, Blu-Ray player, iPod docking station, full size murphy bed, covered balcony with pool view, Kitchen with granite countertops and stainless steel appliances, Bar seats 3, Dining Table seats 6, King Master with LCD TV, Blu-Ray player, King Bedroom, shares access to Hall Bathroom, Bedroom with a Double Bunk Bed, Laundry with Washer/Dryer.